The Milan Reference 10 Hi-Fi 3 Support Furniture Range have been introduced by Custom Design as a result of our customers requests. Customers perceptions of Hi-Fi furniture have changed, design is important, contemporary more than accessory. That is why the Milan Reference 10 Hi-Fi 3 Support Range have been designed as a piece of furniture, then with the 26 years of experience and knowledge the details added to enhance the Milan Reference 10 Hi-Fi 3 Support Range acoustically to the highest standards without compromise to the design. All of the Milan Reference 10 Hi-Fi 3 Support Furniture Range are manufactured from solid hardwoods including Oak, Walnut and Ash. All of these hardwoods are harvested from professionally managed, sustainable forests where more trees were planted than harvested in the last 30 years. Custom Design sources all cardboard packaging from only PEFC or FSC certified companies. 76% of the cardboard packaging has been manufactured from recycled material, which can be 100% recycled. 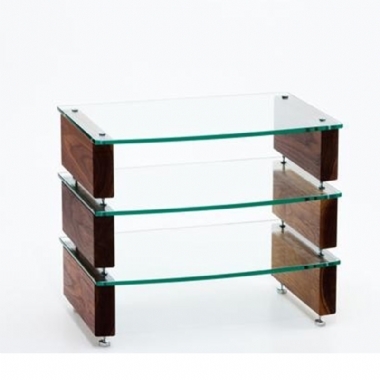 The 10mm glass shelves are manufactured to EN 12105-02, with polished edges and available in Clear or Black finish. The hardwood and glass shelves can support 50kg per shelf and a discrete radius front edge provides the Milan Reference 10 Hi-Fi 3 Support Range with another distinctive design feature. All of the Milan Reference 10 Hi-Fi 3 Support Range are supplied with standard spacing of 150mm. A 200mm, 250mm and 300mm shelf spacing are available as an optional extra on request.